Alfa offers the complete line of color change chemical indicators designed to meet industry standards. 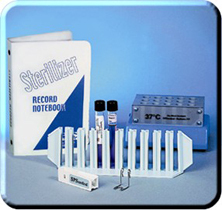 Each CI product visually verifies that items have seen the sterilization process and should be used in conjuction with routine"spore testing" as part of an overall sterility assurance program. 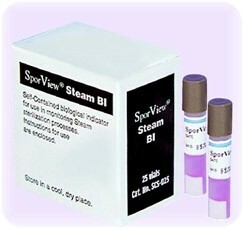 An in-office BI system certified for use with saturated Steam or EO gas sterilization processes. After processing in a normal load, the user activates the media vial then incubates at 56°C (Steam) or 37°C (EO gas) for 48 hours. A color change in the media of a processed BI indicates sterilizer failure. 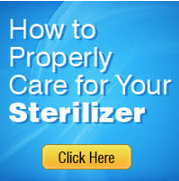 An error-free, in-office BI system certified for use with saturated Steam sterilization processes including liquids. After processing in a normal load, the SporAmpule is incubated at 56°C for 48 hours. 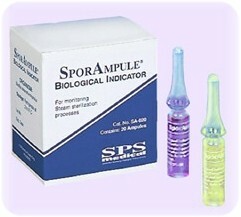 A purple to yellow color change and visible turbidity of a processed SporAmpule indicates sterilizer failure. An in-office BI system certified for use with Steam, EO gas, Chemical vapor and Dry heat. After processing in a normal load, the user aseptically transfers the BI strip into media and incubates at 56°C (Steam/C-vapor) or 37°C (EO gas/Dry heat) for 7 days. A color change and visible turbidity of a processed BI indicates sterilizer failure. Culture Media, Transfer Rack, preset Dry Block Incubators and Record Notebooks are available as individual items. Incubators will accommodate all SPSmedical products and carry a lifetime warranty. 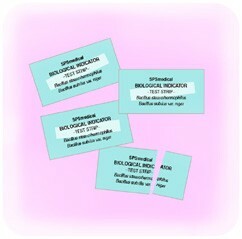 Geobacillus stearothermophilus and B. atrophaeus spores are stocked in dual species and single species formats. Custom population lots and B. pumilus spores for radiation process monitoring are also available. SPSmedical BI strips are manufactured with a two (2) year shelf-life under cool, dry storage. Each shipment includes a Certificate of Performance documenting spore population, spore resistance, D values and expiration date. Strip itself has lot number identification imprinted. Peace of mind is immediate with this "advance technology" medical device. Scientifically engineered to integrate all 3 critical parameters of sterilization (time, temperature and saturated steam), the SteamPlus Sterilization Integrator is certified to perform equal to a biological indicator plus an added safety factor.